The Decorated House: ~ Happy New Year! Will there be a long, or short, list of resolutions for you this year? I think the new year will be another good one to just re-focus a bit. The year in review was a productive one for getting many things done around the house which had to be done. It's always like that when you live in an older house. Like us, they need a bit more upkeep with the passing years, but we're worth it, we think. This is a close up of that pretty MacKenzie Child's harlequin star that brings out the black and white motif for Christmas decorating, and now for New Year's as well. The shiny silver with the black is a perfect complement to the Mercury glass. As I promised myself last year, I took a few extra moments to better organize the Christmas decorations this year while putting them away. More should have been given away, but they did get neatly packed and labeled. If they don't get used next year, will they then be given away? We will see. 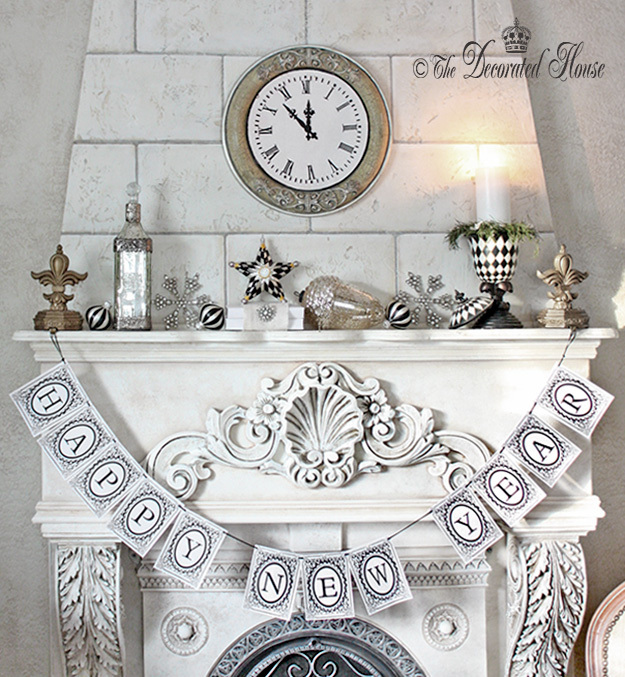 The little whimsical garland saying Happy New Year is simply printed on white paper and strung with black ribbon. You can see a hole punch was used to put holes on each side at the top so ribbon could be strung through them. The "clock" was made from a few different graphics and added to a round mirror. 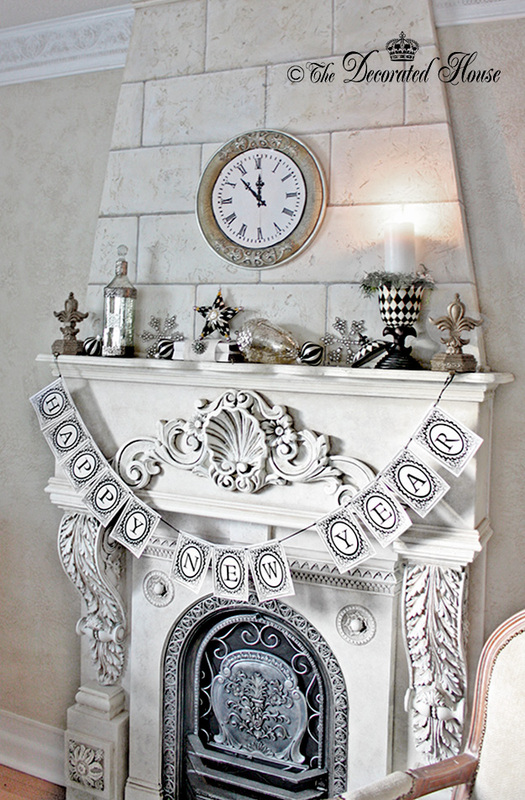 Happy New Year Garland - Banner Made from White Paper and Black Ribbon, Letter Designs by me, printed on white paper, cut, holes in the top corners, strung on the ribbon. Clock Face Design made from a few graphics, printed on paper, cut out circle and double-face taped to a round mirror. Set for a few minutes to midnight. for the first time as well. filled with Peace - Light - Love - Joy. Your mantel looks so pretty, Donna! I love that black and white star, as well as your banner. I have "goals" rather than resolutions that I would like to accomplish in the new year. Hopefully, I have made them realistic! I'm betting you get a lot of those goals accomplished this year too! It will be fun seeing what new things you are up to in the new year. Simply gorgeous Donna! Thank you for sharing all year long. I look forward to more from you in 2015. Thank you for stopping by and taking a moment to send your lovely note. Oh, dear friend. . .this is exquisite!!! I didn't label the Christmas decorations as they were put away this year. I have a plan to go through them in the Summer and purge, purge, purge. Then, they will be packed for donating in the Autumn to a local charity. I do believe that our Seasonal decor evolves over time as well as our home decor. Time to unload those from the past to make room for 'new', refreshed decorations. 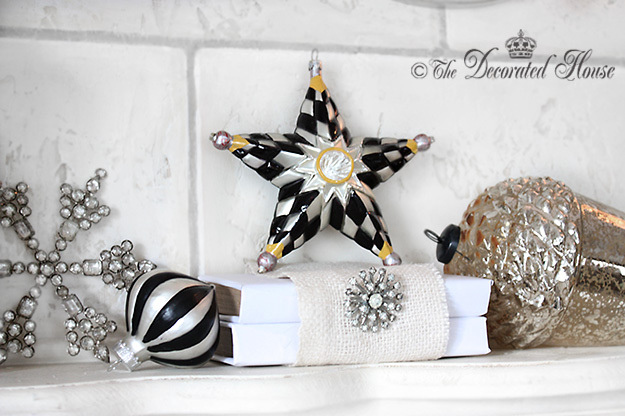 Love your timeless classic black & white Christmas through New Year's decor!!! Your idea of going through things and do a give-away in Fall is a great idea. I just forget I have the things put away until it's too close to Christmas! Maybe I'll do better this year. And as you said, our seasonal decorations do change over the years, and it's nice to think someone else will continue to enjoy them.